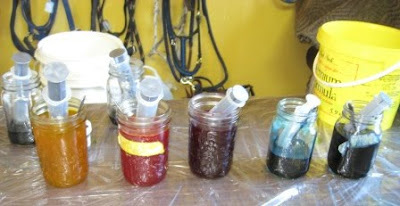 Here are the dyes mixed and ready to use on the Thread or Fabric. Note the back ground. I have moved the saddle racks to the main barn and set up my table in the tack room, close to the sink. In the back of the photo is the bridles hanging on the wall. 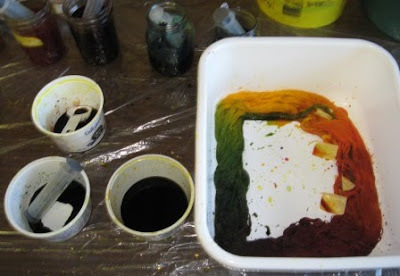 I have mixed some of my primary colours to make the green, brown and the oranges I need to make this thread. I am trying to copy a thread I made a few years ago. I do not keep real records on the thread dying as there is always a change, thread type, amount of thread how much dye and at what strength. I have been dying thread for long enough that I can just mix and see. I know that what I see wet is also going to lighten many times. Here is a great thread rainbow coloured. 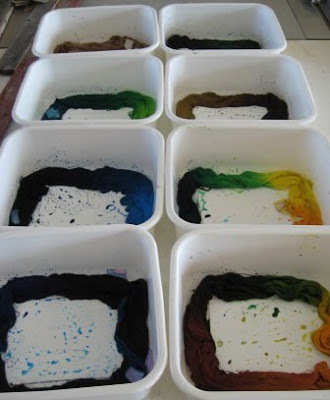 Here are the eight trays of thread that I got dyed today. 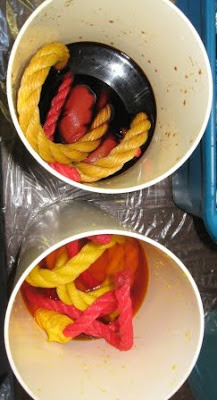 I also did some fat quarters on rope and dyed in one colour. I will have to show more photos of this to explain. 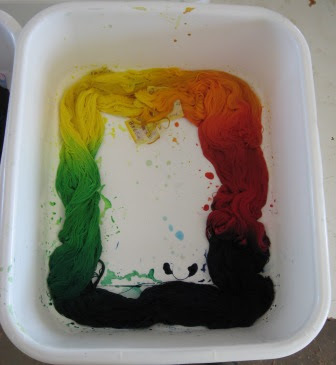 I plan to wash and redye these smaller pieces. I also did about 10 to 12 meters of fabric in some soft pinks, blue, and purple. Sorry no photos of these fabrics, but when they are washed they look great and I should take photos.